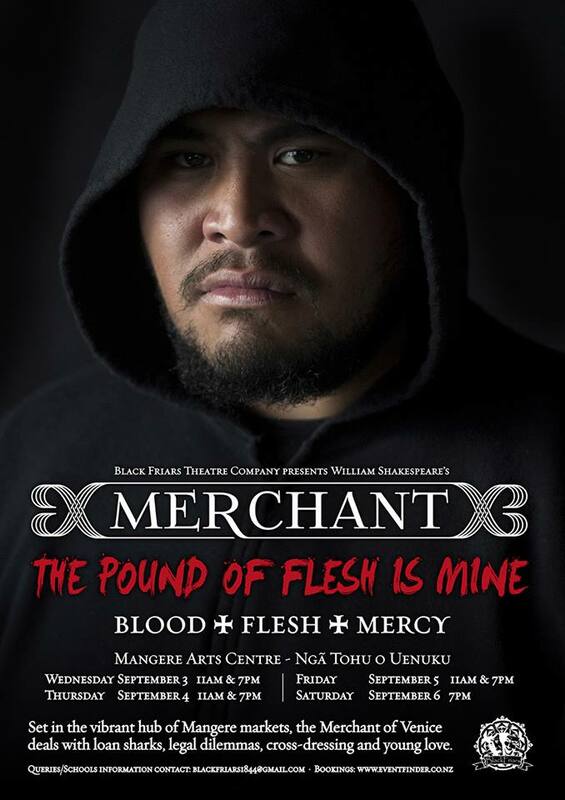 Lauie Sila – my 26 year old little/big cousin plays one of the lead characters in Shakespeares “The Merchant” which is currently playing at the Mangere Arts Centre. I caught up with him and my cousin Olive Asi (who is also in the theatre production) when they came over to do the shoot for their promo posters. I like knowing how people are related so in case you guys were wondering too – Lauie’s maternal grandfather and my paternal grandfather are brothers. Pretty sure both of them were 6ft8 – Hence the tall genes lol! Over the years I’d been to see him perform in his high school production of Joseph & the technicolour dreamcoat & a couple of his first shows when he first started out with the Black Friar Theatre Company. It’s awesome to see that 10 years later he’s still involved in theatre and the arts. You might also recognise him from a dishwashing ad here in NZ lol! Me: You’ll be performing in Shakespeare’s Merchant of Venice and playing one of the lead characters – Shylock – the villain of the story. Have you played this character before? Lauie: No it’s my first time and the first time playing the villain! I usually play the hero in our Black Friars productions but I just thought I’d change it up and test myself playing the villain. Me: How long have you been with The Black Friars now? Thats the theatre company you’re with right? Lauie: Yeah, um I think it’ll be going on 8 years now cos we kinda started it when we left school. Well, my friend started it and I just tagged along but yeah, it’s been 8 years. It was Michelle (Black Friars manager/director), Misipeli, Billy Revell & me and we all kind of got together and decided to start a theatre company to make Shakespeare more relevant to kids our age at that time. When we were in school we’d mostly just done excerpts from scenes in like Shakespeare competitions cos like when you join drama there’s no actual competitions in schools in NZ for drama except for that one Shakespeare comp. We kinda got together and decided to take a scene to one of those comps and yeah, we’ve been going ever since. The comp is just for school kids and they have different zones like South Auckland, East Auckland and it’s all over New Zealand. So they go through the regions and then they all meet up at this one national festival in Wellington and it’s held over Queens Birthday weekend. Me: Is that how you started in theatre? Through the school Shakespeare comp? Lauie: Yeah, just through school. I’d had a bad year of injuries one year with rugby cos I kinda went to Wesley to play rugby, then I had one bad year of injuries and I just happened to walk into drama class one day and just stayed there. Just …. cos it was fun and I didn’t want to go to Science (laughs) and yeah, just found that I was naturally talented in that area so I’ve just stuck with it ever since. The Black Friars it’s always been a fun group aye and yeah, we just like clowning around with each other and making jokes. It was never anything serious like a serious job or whatever it was just for fun but we just loved doing it. I was teacher aiding when I left school just to give something back and help out with Michelle and stuff and the drama department there. I mean me and my year were the first drama class at Wesley College so we kind of started it and I wanted to keep it going. So yeah, thats why I pretty much stayed there and helped out and yeah, it was good. I think I was there for like 3 years just helping out with productions and stuff. Me: Is The Black Friars Theatre Company the only one you act in? Lauie: Yeah, it is at the moment. I did one year where I toured in a kids show with Duffy Books – the Duffy Theatre Foundation. That was my first gig away outside of the Black Friars. It was theatre in schools. 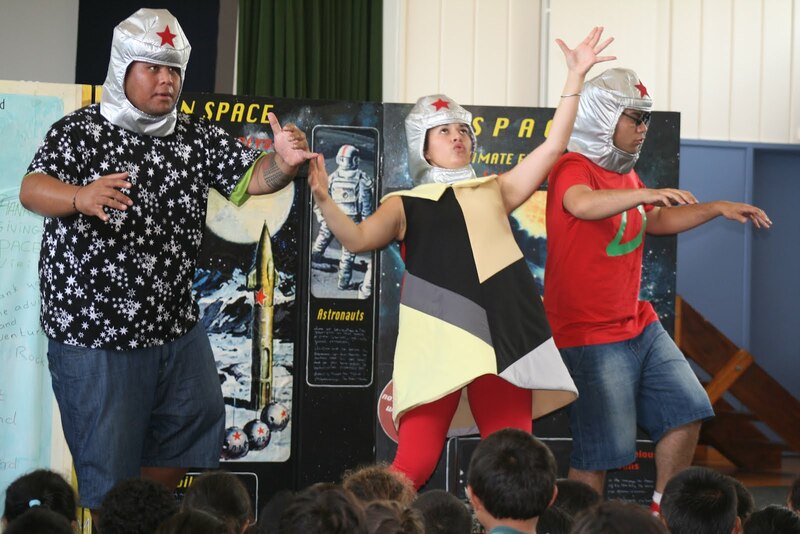 So we took around a one hour show all over New Zealand to Decile 1 and low decile schools – you know schools that can’t afford to provide books for the kids. The low decile schools are in the Duffy programme and we’d just take the show into those schools promoting books and reading. We were split up in to 2 teams. North Island and South Island and yeah for one year we just toured and performed at pretty much every school – it was mean we had so much fun man. Me: Does it pay well? Lauie: Yeeeeeeeeeah, nah aye? (laughs) thats why I kind of had to get a day job. You still need your day job aye? Not much money in theatre work. I mean it’s good now and then but it’s not stable. It’s only when you get the gigs and thats hardly ever. I found that as we got older it was harder to keep the group together and thats when our shows started to get more spread out. It was hard to get everyone together cos everyone started having babies and getting married and stuff. Right now we just try to put a show together when we can get everyone available. We try to put together at least one classic a year, like a classic Greek piece or Shakespeare …. so this would be our one classic/Shakespeare for the year – the Merchant of Venice. Me: Have the Black Friars taken their shows internationally or have they stayed doing shows here in NZ domestically? One year, Billy and I actually got selected out of the whole of New Zealand – it was in our 7th form year – they choose the top 24 in Shakespeareans in schools so me and Billy got selected to go to London and perform at the Globe Theatre as part of the NZ young Shakespeare company but unfortunately due to money terms I couldn’t go cos we had to fund our own trip but Billy went. 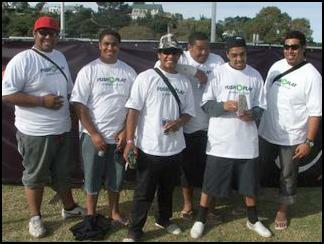 It was pretty cool cos we were the first Pacific Islanders to have been selected for it. Me: So is the core group of guys still in the Black Friars? Me: Of the Shakespeare productions you’ve done, what would be your favourite? Lauie: My favourite? Ummmm I’d have to say Casio. I played Casio in Othello. Yeah, I just found it fun to play cos he was a ladys man. I like playing characters that are far away from my personality (laughs) so yeah, it was fun playing that. Me: Whats your process when it comes to the script? Do you all write what you’re going to say or do you have script writers? Lauie: Oh nah Michelle our director chops the script up for us just to cut it down cos we’ve found that with our Pacific Island audiences you can’t really hold them that long you know? (laughs) especially with like Shakespeare pieces that are like 2 – 3 hours long so we cut down to the main points of the play and stuff thats relative to us. Me: Do you have a manager for like your acting and stuff? Me: What TV work has come to you being signed with Kathryn Rawlings. Lauie: Just 2 ads so far. I got a Cadbury ad and an ad with Finish …. holding a spoon up …. and looking lost (laughs) It’s pretty easy work. I’ve been getting heaps of auditions but just these 2 gigs aye? So the agent will find me work and then email or call me up and tell me to be here at this time. Me: Other than the Merchant do you have any other projects coming up? Me: What advice would you have for people who want to get into acting? Lauie: Acting? I guess the old cliche really – stick to what you’re doing and don’t worry about what others say. There’ll always be outsiders looking in and judging you. This is what I used to tell my kids at Wesley – Don’t worry about what anyone else is thinking just get in the zone and if you feel happy on stage and thats where you wanna be then thats where you wanna be. Just stick to it and if you think you’re good at it you’ve got it! Me: Is there anyone in your family you think you got the creative acting buzz from? Me: Lastly – Inspirations in the acting world? Lauie: I guess all the Polys that are in the game at the moment like Jay Laga’aia – I went and saw his musical “Wicked” and it’s real cool seeing a Poly brother – especially a Samoan in a Broadway show, so yeah, those kind of guys inspire us – guys like Nathaniel Lees. Seeing Samoans in the matrix! 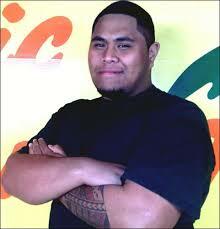 Dwayne Johnson – yeah, all the Polys, all the Polys in the game I really look up to them. Other than those guys it’d probably be Al Pacino. Lauie: Oh man there’s heaps – I can’t think of one right now …… um I like this one line from Django (Jamie Foxx) where he just shoots this guy and he says “I like the way you die boy” (me laaaaughing) Yup I like that – I don’t know why but that just stuck out to me and I was like YEEYAAA! Thats gangsta!